The Festival of Shavuot (also known as the Festival of Weeks) comes in the springtime, toward the beginning of summer. It is one of the Shelosh Regalim (the three pilgrimage festivals). When the First and Second Temples stood (until 70 C.E. ), many Jews would travel to Jerusalem three times a year, bringing offerings and supplies for celebration. The three occasions were Pesach (Passover), Shavuot, and Sukkot. The Torah is clear about the meaning and rites of Pesach and Sukkot, but little besides sacrifices are prescribed for Shavuot, and no particular meaning is ascribed to it. I suspect that in fact Shavuot was not originally a separate festival, but the culmination of the long festive season inaugurated by Pesach, which lasts seven weeks (the period of the Omer) and is capped by Shavuot. From the second day of Pesach, Jews count the Omer for seven weeks (seven times seven days -- a reflection of Creation itself) and the following day (the 50th day) is Shavuot. If this is correct, then there are two pilgrimage periods: a week-long period in the autumn (Sukkot) and a week of weeks in the springtime (Pesach/Omer/Shavuot). The two festivals would be opposite one another on the calendar providing a fascinating symmetry. When the Second Temple was destroyed by the Romans in 70 C.E., it was no longer possible to keep Shavuot, since the only observances associated with it were sacrifices made in the Temple. The Sages sought to instill permanent meaning and relevance in the festival so that it would be neither lost nor forgotten. In examining the sacred texts, they noted that after the Israelites left slavery in Egypt, they traveled to Mount Sinai where, seven weeks after the Exodus, Moses ascended the mountain to receive God's Torah. Shavuot thereafter became a commemoration of the Revealing of the Torah at Mount Sinai. It is known as the time of Matan Torah (the Giving of the Torah) and is celebrated as the moment in history when Israel entered into a covenant with God. Pesach (in the springtime) tells the story of the origins and meaning of Israel's peoplehood, a people delivered by God from slavery and degradation in order to enter into a covenant with God. Shavuot (50 days later, in late spring/early summer) recounts the forging of that covenant at Mount Sinai, where God reveals the Torah to Moses and the people affirm their commitment. Sukkot commemorates the Israelites' forty years of wandering in the wilderness of Sinai before they entered the Land of Israel, the land God promised to Abraham and his descendants and which is an integral part of the covenant made at Mount Sinai. Taken together, the three pilgrimage festivals tell the story of the Jewish people formation and growth: Exodus, Covenant, Wilderness preparation to enter the Land of Israel. Shavuot is celebrated with Torah study and greenery: Torah study commemorates the Giving of the Torah at Mount Sinai, and greenery symbolizes the early summer and early harvest season. Many communities hold a Leil Tikkun Shavuot, a long session of Torah study, late into the night. It may last several hours, or in some cases, the entire night. Just as the Israelites stayed awake the night preceding their receiving the Torah, many Jews stay awake the night of Shavuot studying the Torah. Fresh green plants adorn many sanctuaries on Shavuot, symbolic of the season in which it occurs. The Torah reading for Shavuot includes the Ten Commandments, symbolic of the covenant of Torah. However, there is a separate set of trop (cantillation marks) by which the text of the Ten Commandments is chanted on Shavuot, for on this occasion we relive the experience of revelation rather than recall it. On Shavuot, every Jew stands at the foot of Mount Sinai and receives the Torah anew, to cherish and convey to the next generation. 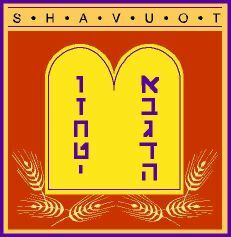 Shavuot is an occasion to read one of the megillot (the five scrolls) in addition to the Haftarot for the occasion; the Book of Ruth is read on Shavuot. Ruth tells the story of a young Moabite woman who, after the tragic early death of her husband, leaves her homeland to travel with her mother-in-law Naomi, to the Land of Israel. Ruth commits herself to Naomi, saying, "Where you go, I will go; where you lodge, I will lodge; your people are my people, and your God is my God; where you die, I will die, and there will I be buried. Thus may God do to me, and so may God do more, if anything but death separates me from you" [Ruth 1:16, 17]. Ruth's exceptional commitment, and moreover, her taking on the covenant of Israel as her own, makes her an excellent role model, especially on Shavuot, when we focus on the covenant of Israel with God. Moreover, Ruth was the great grandmother of King David, the paradigm for the messiah. Conservative and Orthodox Jews keep Shavuot for two days; most Reform Jews keep Shavuot for one day. Confirmation ceremonies are traditionally held on Shavuot because the confirmation class symbolizes the generation that stood at Sinai and received the Torah; so too does this generation receive the Torah and pledge themselves to pass it on to the next generation. In the home, Shavuot is ushered in with the lighting of candles (the blessing ends "v'tzivanu lehadlik ner shel yom tov") and the festival kiddush. It is traditional to eat dairy products on Shavuot. Explanations abound, but the most widely offered explanation is that when God revealed the Torah at Mt. Sinai, it was the first time the Israelites were aware of the laws of kashrut. They realized that their utensils were not kosher, and therefore ate dairy products until they could acquire kosher utensils for preparing meat. Among many Jews, it is customary to eat blintzes on Shavuot, undoubtedly because they are so delicious. The Counting of the Omer begins on the second night of Pesach and continues for seven weeks; the following day -- the fiftieth day in the counting -- is Shavuot. My colleague, Rabbi Mark Hurvitz, invited me to design a calendar for counting the omer. I enlisted the help of my father, an artist. My father offered several designs based on ideas Rabbi Hurvitz generated concerning color and tone intensity. You are welcome to click on the links to see his efforts (first, second, third). The best, I think, portrays the journey from Egypt to Sinai as an upward spiral -- much like one ascending a mountain. You can find it here.